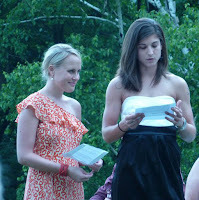 At my daughter Katie's wedding to our fabulous new son-in-law Ethan, they had several readings. 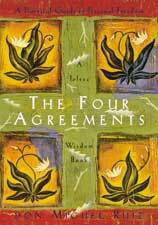 One of my favorite was from Don Miguel Ruiz's Code for Life entiled "The Four Agreements", read here by my niece Elizabeth McKinney and Candy Saunders. I want to share his wisdom as I think it applies to marriage but to life in general and work in particular as well. These simple yet beautiful ideas can by the inspirational code for your life; personal development, behaviour, communications and relationships. Agreement 1Be impeccable with your word - Speak with integrity. Say only what you mean. Avoid using the word to speak against yourself or to gossip about others. Use the power of your word in the direction of truth and love. Agreement 2Don’t take anything personally - Nothing others do is because of you. What others say and do is a projection of their own reality, their own dream. When you are immune to the opinions and actions of others, you won’t be the victim of needless suffering. Agreement 3Don’t make assumptions - Find the courage to ask questions and to express what you really want. Communicate with others as clearly as you can to avoid misunderstandings, sadness and drama. With just this one agreement, you can completely transform your life. Agreement 4Always do your best - Your best is going to change from moment to moment; it will be different when you are healthy as opposed to sick. Under any circumstance, simply do your best, and you will avoid self-judgment, self-abuse and regret. FYI, I'd never heard of Don Miguel so I looked him up. For many years he practiced as a surgeon. Following a car crash in the late 1970's, Don Miguel reverted back to his Toltec roots. The Toltec view science and spirit as part of the same entity, believing that all energy - material or ethereal - is derived from and governed by the universe. And thanks to my wonderful Katie for sharing her wisdom with me. loved the 4 agreement concept. so close to you. thanks for letting me know about this.